This week has been all about rain! Along with the rain and older weather comes the desire to stay in bed all day with a hot cup of tea and a good book. Alas…I have a 6-year-old and an 8-year-old, I’m a busy acupuncturist, and staying in bed is rarely a choice. But oh, how LA drivers in the rain stress me out! All I want is to eat is soup. At 4:45pm tonight, after I got home from work and realized the meal I had carefully planned (on paper) had somehow not made itself, I opened the fridge for inspiration. The brown paper bag of Shitake Mushrooms that I’d picked up at the Pasadena Saturday farmer’s market were calling to me. I had made chicken bone broth over the weekend and still hadn’t frozen all of it in jars yet. “SOUP CAN STILL HAPPEN!” I thought, rummaging in the fridge’s vegetable drawer. Follow my recipe here or adapt it and make it your own – then tell us what you did in the comments section. 1.) Melt 2 T. butter (or ghee or coconut oil) in a large pot or Dutch Oven. 5.) Add chicken bone broth & water, stir, bring to a boil, then reduce to a simmer. 6.) Add sprig of fresh rosemary; add cumin and/or chili powder/chicken seasoning along with another splash of olive oil. 7.) Simmer for 15 minutes, until vegetables are tender. 6.) Stir in cooked rice & chopped chicken. 7.) Add salt and pepper (to taste). 8.) Simmer another few minutes, taste the soup for seasoning and adjust if necessary. Serve with fresh sourdough bread and some dill pickles! 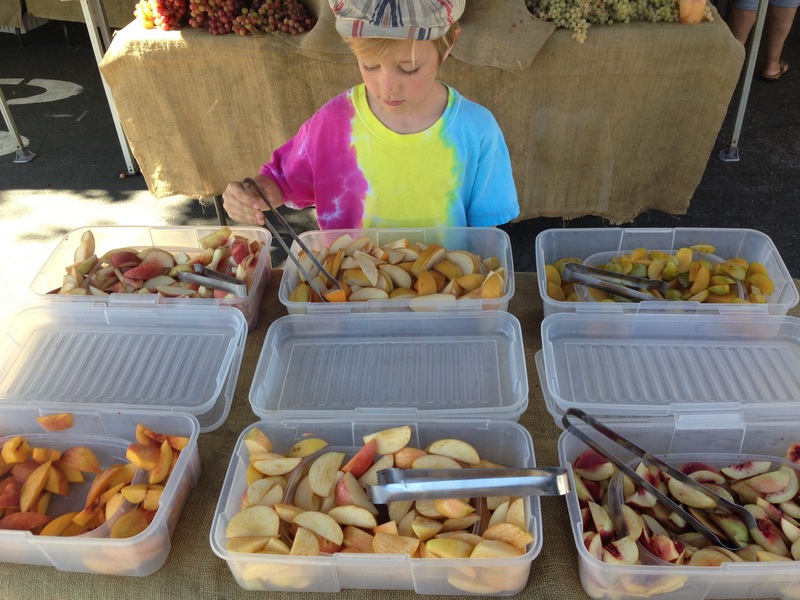 This is the second in a series of posts on how to feed your family on a budget by shopping at your local farmer’s markets. I’m focusing on the markets I go to most often, sharing tips on the best farmers, ranchers, bakers and makers in the Southern California area, particularly Northeast LA, the San Fernando and San Gabriel Valleys. Sundays, 9am-2pm, 2300 Honolulu Avenue, at Ocean View Blvd., Montrose, CA 91020. The Montrose Certified Farmer’s Market is closed only one Sunday of the year (Easter). 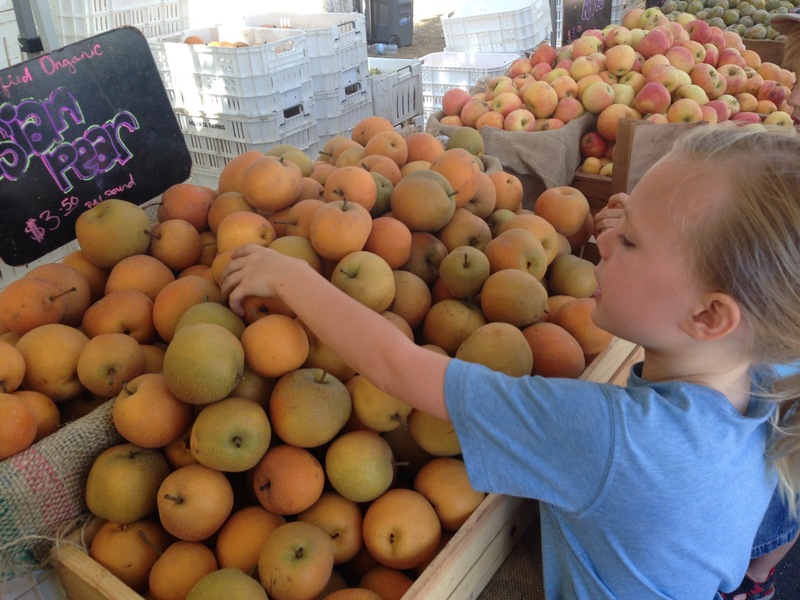 Yesterday I took my kids for our weekly Sunday morning outing to the Montrose Farmer’s Market and gave them full access to the samples so I could photograph and talk to my favorite farmers and share their stories and goodies with you. 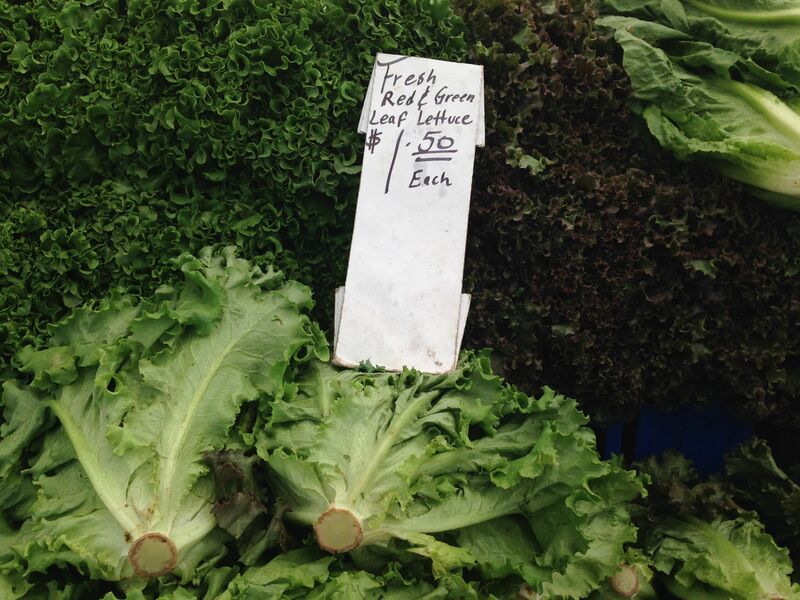 In a typical week, I shop at 2-3 different local farmer’s markets in the Los Angeles area. As a full-time working mom, I get teased by my friends for going out of my way to buy directly from the farmers when there are so many supermarkets nearby. That said, when no one has broccoli because it was over 100 degrees for the past two weeks and all the plants started flowering, I have to find something else to substitute for the kids’ favorite vegetable. Montrose is my favorite farmer’s market of the week. It’s an Experience – it feels like a small town – and it’s really fun for families. I’ve been going to it weekly for over 6 years, and we have become friends with many of the farmers who supply us with food. Here are my kids about a year and a half ago, when I could still get away with a double stroller! In fact, there are so many excellent vendors I want you to know about, it’s too much for one post! I will break up by coverage of the Montrose market into two parts: Part 1 (organic fruits and vegetables) and Part 2 (fresh bread, naturally fermented foods and beverages, Goat Soap and gifts). Allow yourself at least an hour at this market (more if you’re bringing kids who want to play on the bounce house or check out the goats, baby pigs and chickens! ), and get there early. Oh and bring bags! Some vendors at this market take debit & credit cards, but most don’t, so bring cash or visit one of the bank ATMs on Honolulu. Unfortunately, this market is not yet set up to take SNAP-EBT or WIC Benefits, nor do they offer the opportunity but I asked the market manager and he said they’re working on it. 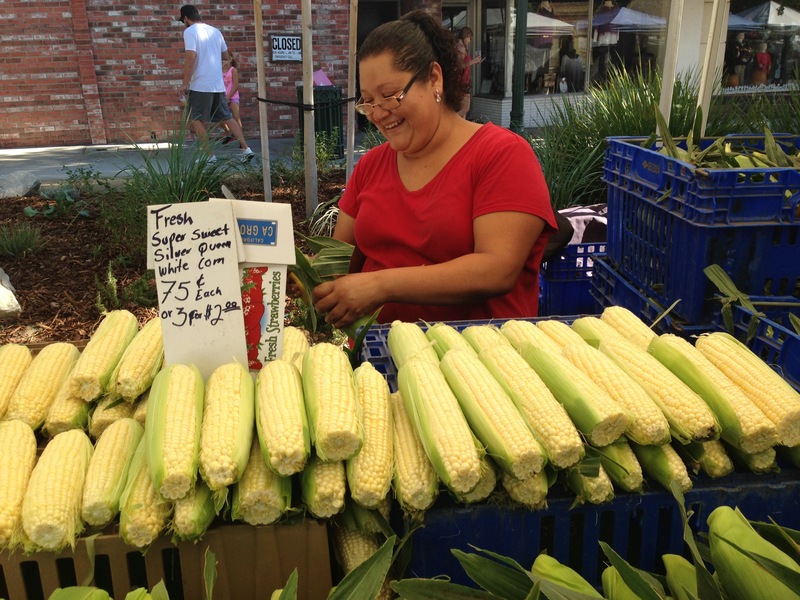 Here is an impressively long list of Los Angeles-area farmer’s markets that do accept SNAP. Following are my favorite spots to get vegetables, fruit, honey and nuts, but this is by no means a complete list of what you can find at this market. 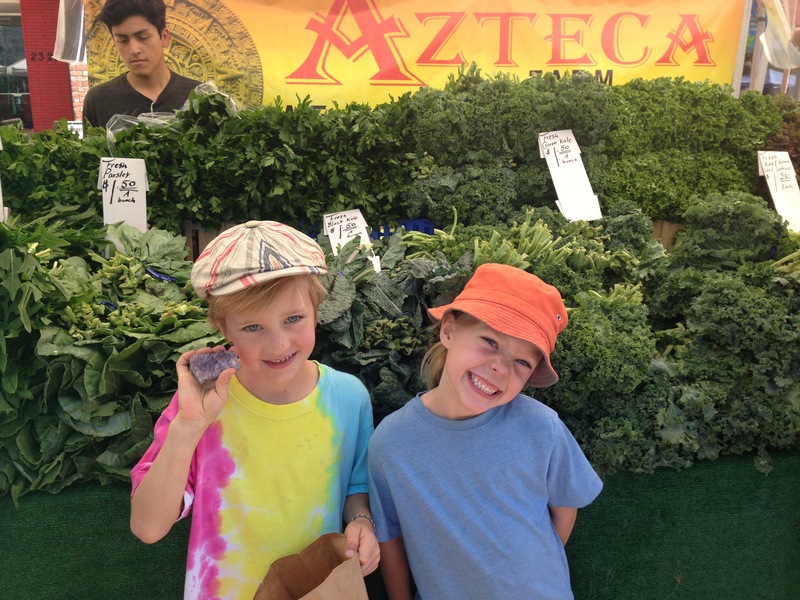 Azteca Farm (no website) is not a Certified Organic farm. However, it is a small family farm in Piru, CA (near Fillmore) that has practiced organic and non-GMO farming practices since the 1970’s. (They can’t use that word since they haven’t gone through the official certification process.) After years of buying and eating their produce and developing a friendship with this family and visiting their farm, I am confident in the quality and safety of their fruits and veggies. Co-owner Irma is here every Sunday except Easter, along with her two teenagers, who help sell their family farm’s bounty of fruits and vegetables directly to customers. Azteca is known for a wide variety of leafy green vegetables, lettuces, several varieties of zucchini, beets, corn, melons, passion fruit and the most delicious strawberries I’ve ever had. (Sorry, they’re between seasons right now on the berries!) They also sell traditional seasonal Mexican herbs and vegetables such as purslane, cilantro and fenugreek. Pricing is very reasonable: as of yesterday, one generous head of black or green kale, chard, red or green lettuce was $1.50 each (vs. $2.99 to as much as $5/head in the grocery stores); zucchini (4 different varieties) is $2 per pound; Corn 0.75 cents per ear. I have gotten many tips from Irma on my own home gardening over the years (“spray your Kale with peppermint soap and water: the aphids will stay away!”). Yesterday, while I was shopping at her stand, we chatted about how her farm handles pest control without spraying toxic pesticides or using GMO, pest-resistant seeds. But the fact is, insects need to eat too; it’s all about co-existing. 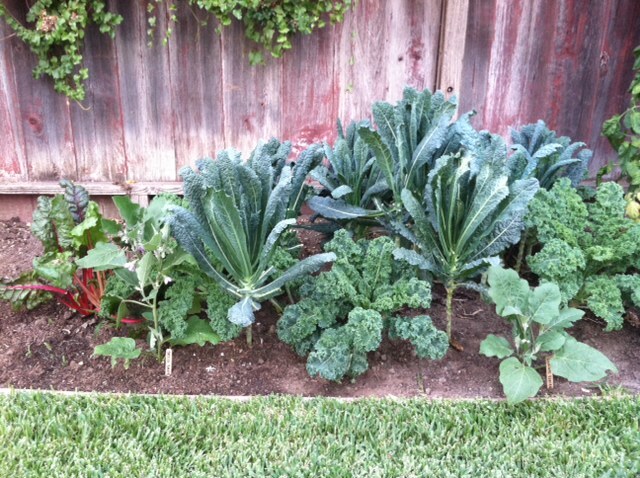 Have the aphids left enough kale for us to pick? Once a year, Azteca hosts an Open House at their farm in Piru. 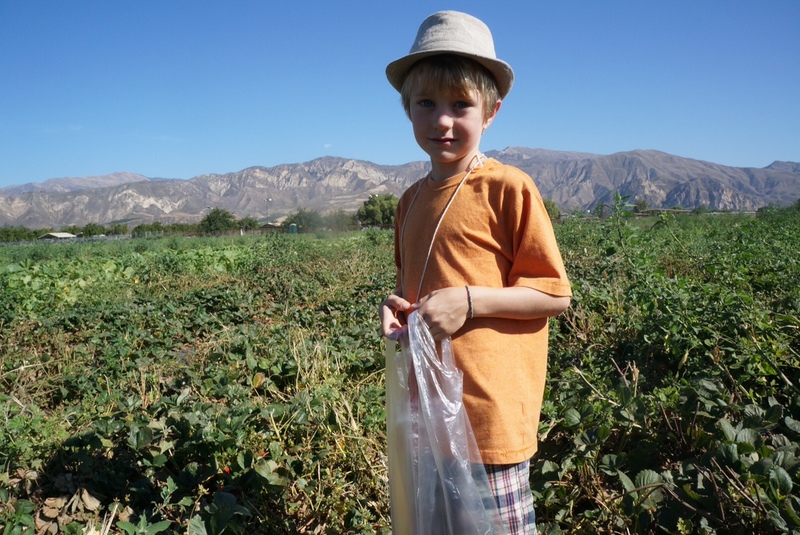 We went last month on a very hot Saturday and they let my kids pick strawberries, which was a blast. 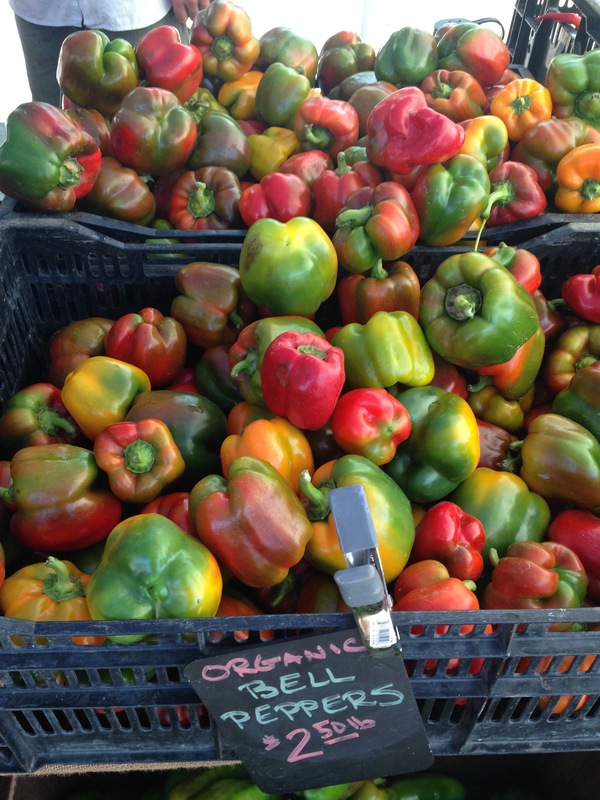 A Certified Organic farm for “a decade or so,” Santa Rita Organic Farm is located in Lompoc, on the Central Coast of California in Santa Barbara County. 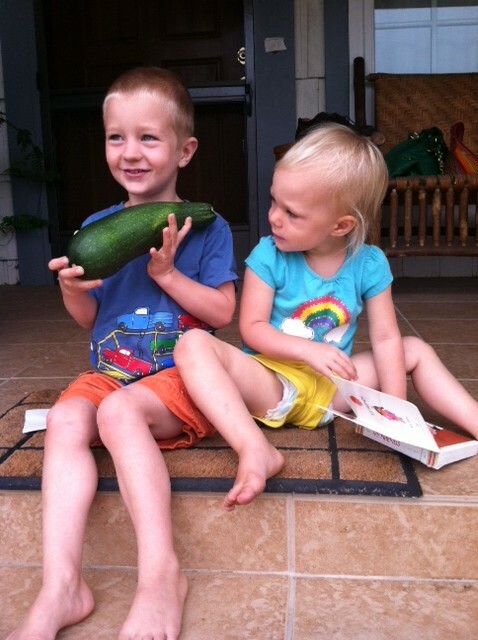 They’re owned by couple Jeff & Roxanne Hendrickson and are well-known for rare and heirloom varieties of produce. They bring a gorgeous selection of seasonal organic vegetables and fruit, including the best carrots and bell peppers I’ve ever had, which are currently in season. At $2.50 a pound, they’re HALF the price of the organic peppers you’ll find in our local health food stores, and they’re not shrink-wrapped. 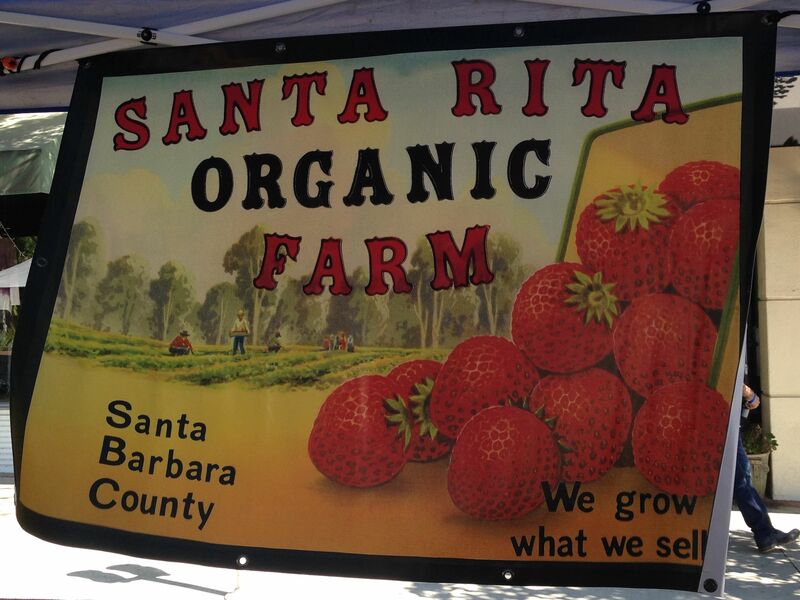 Currently, Santa Rita also has delicious Chandler organic strawberries, Early Girl Tomatoes, Cherokee Purple heirloom tomatoes, Lacinato kale, zucchini, basil, beets, leeks, Anaheim and Jalapeno chiles. When they’re in season, be sure not to miss their Blue Lake beans. Santa Rita’s sales associate Tom told me where else you can snag their yummy goods in SoCal: in addition to the Montrose Sunday market, Santa Rita sells at the Thursday Thousand Oaks farmer’s market, the Friday Topanga market, and the Sunday Santa Clarita market. 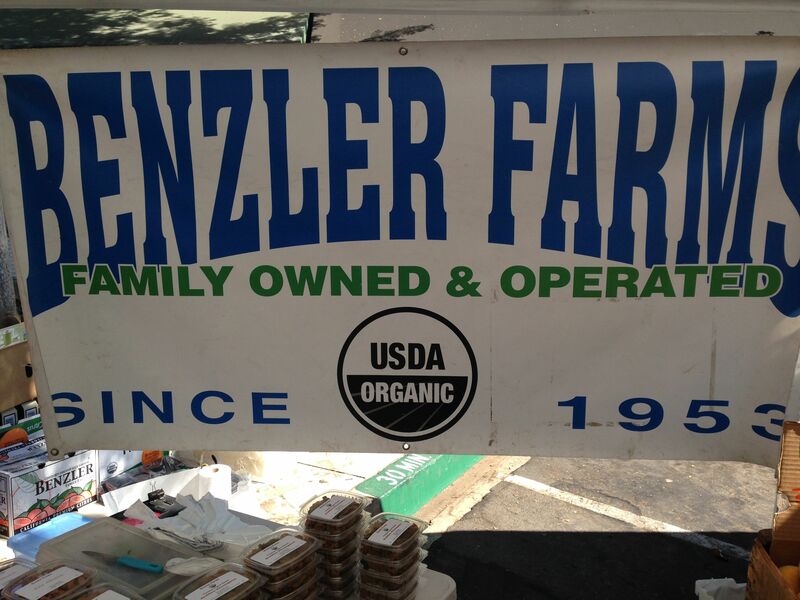 Benzler Farms has been family-owned and operated since 1953, and was the fourth farm in the state of California to receive the USDA Organic certification. I spoke with farmer Hugh Benzler and sales associate Deena about their organic farming practices. He mentioned the importance of not planting tomatoes near grapes and peaches, for example, unless you want tomato worms to destroy your delicious fruit. 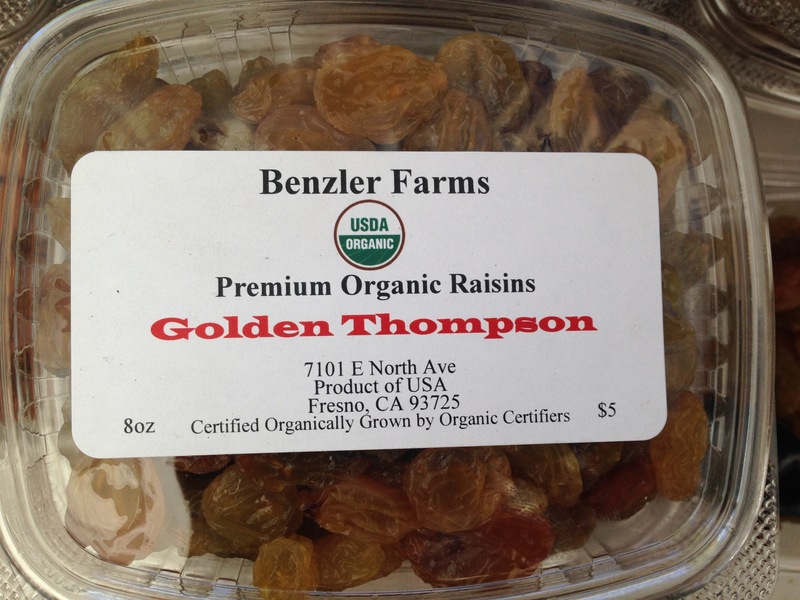 Benzler also sells terrific walnuts, almonds and pecans from 30-year-old organic trees (pollinated by those awesome bees!). I failed to snap a picture. I learned from the folks at Benzler that 90% of honey sold in the USA is from bees that have been fed sugar water or corn syrup (yuck!) and only 10% is from small family farms (like Benzler) that just let bees be bees. The bees that pollinate Benzler’s fruit and nut trees are never fed sugar water, which means their honey contains the necessary characteristics to be effective in treating allergies. During January and February, when there’s not much fresh fruit to be had even in SoCal, I turn to this farm for their Valencia and Blood Oranges. But for now (and likely a few more weeks) they still have peaches! Be sure to check them out, and enjoy the samples they hand out liberally. 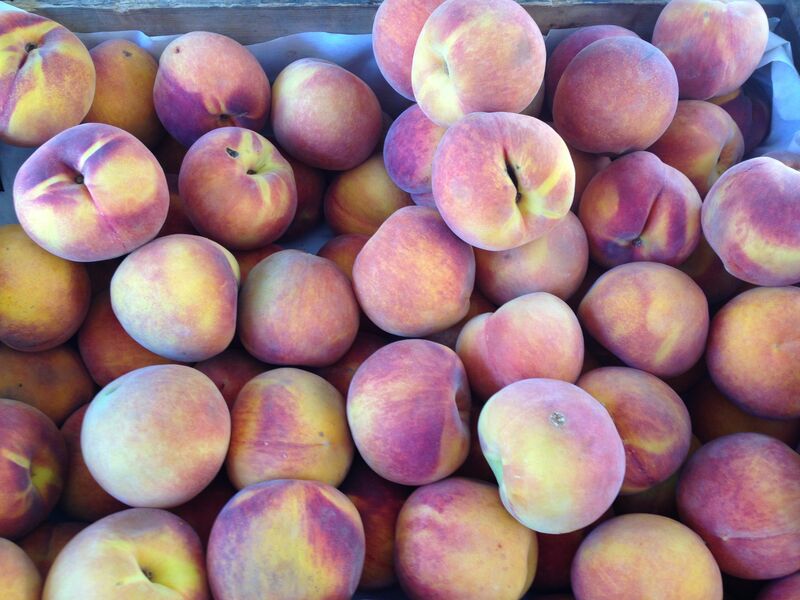 Tied for best peaches in Cali is Sweet Tree Farms, owned by Certified Organic farmer Annie Florendo. 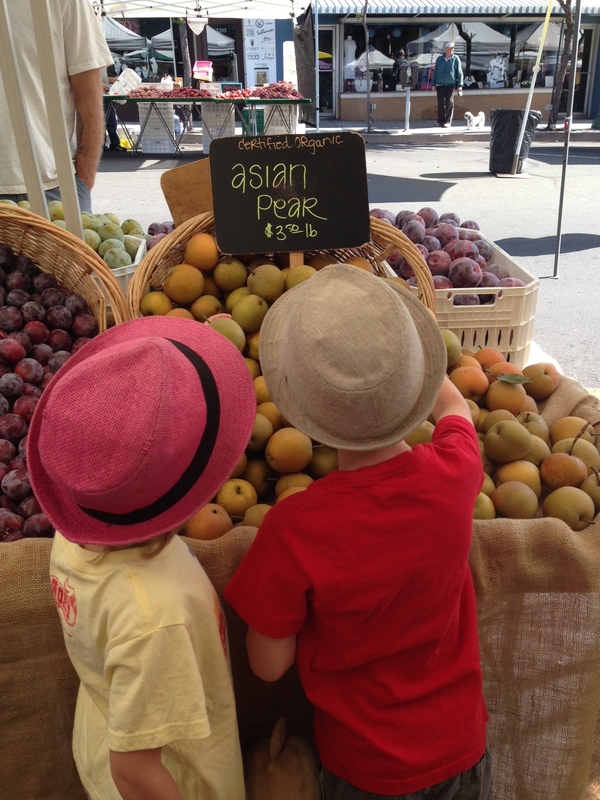 This farm stand is my go-to farm for organic Asian Pears, grapes and an impressive list of heirloom stone fruit. (“Emerald Beauts” are my son’s and my favorite, and they’re perfect sliced into Greek yogurt.) Peaches, plums, apricots, Asian pears and grapes are $3.50 per pound, which isn’t cheap, but you’ll still save money here vs. shopping for organic stone fruit at your local grocery store. 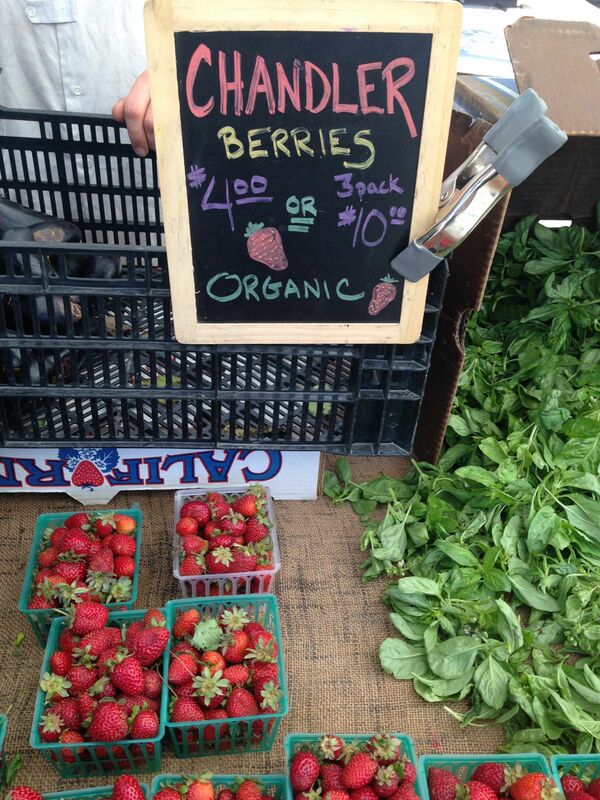 They also grow the best organic blueberries (June and July). I appreciate knowing how the crops are doing week to week – Josh gives us updates – and knowing my fruit hasn’t arrived in my hands after carrying its own plane ticket. My kids and I have been friendly with Sales Associate Josh for over 4 years now. The sample tray at Sweet Tree is a fruit bat’s (ahem, 7-year-old’s) idea of Heaven. Josh tells me there’s about 2 weeks left of peaches and plums (through late September) and about 6 weeks left of grapes (end of October). 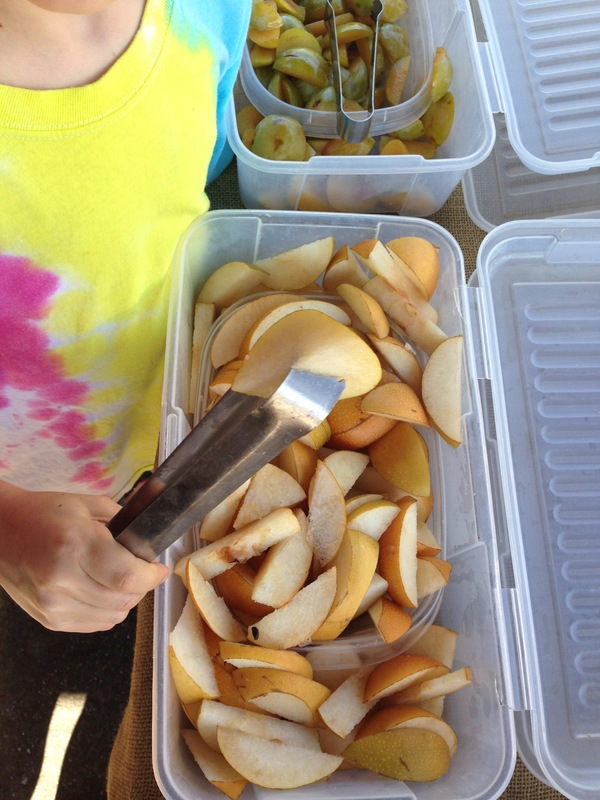 Next up to be picked and brought to the markets are pomegranates and persimmons, as well as more Asian pears. Asian pears, by the way, are an excellent Traditional Chinese remedy for dry cough, which I’ve been treating a LOT of over the past few weeks of ridiculously hot dry weather here in Los Angeles. 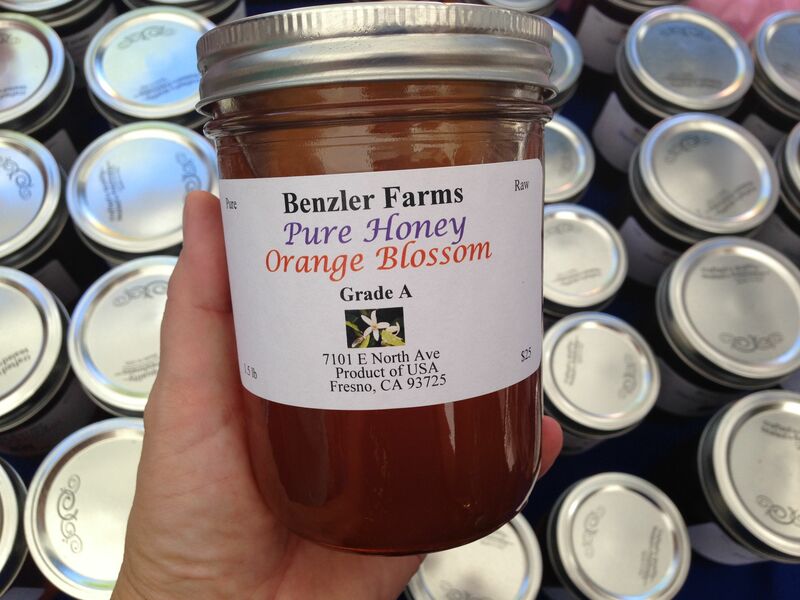 Slice one in half, core it, and steam it for 30-40 minutes, adding 1T of local raw honey (such as Benzler’s! ), and eat with a spoon. 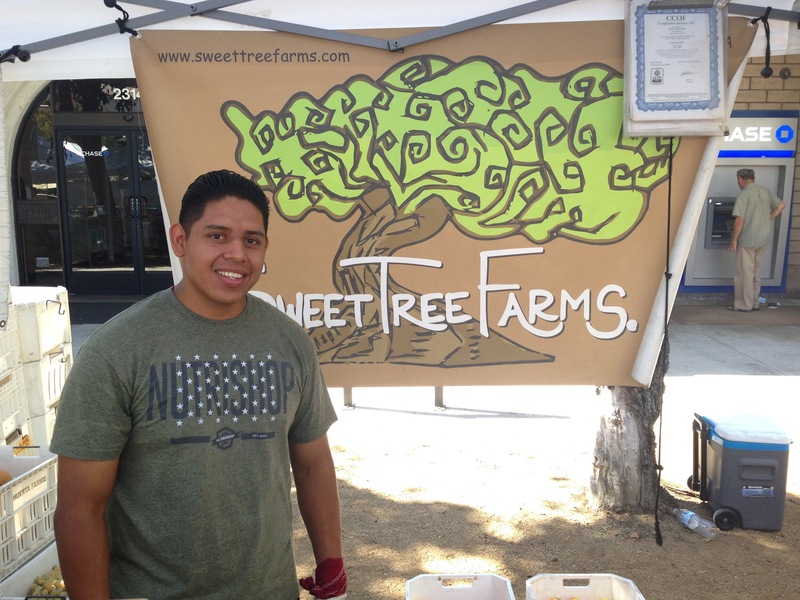 You can also find Sweet Tree at the Silver Lake farmer’s market on Tuesdays and Saturdays. 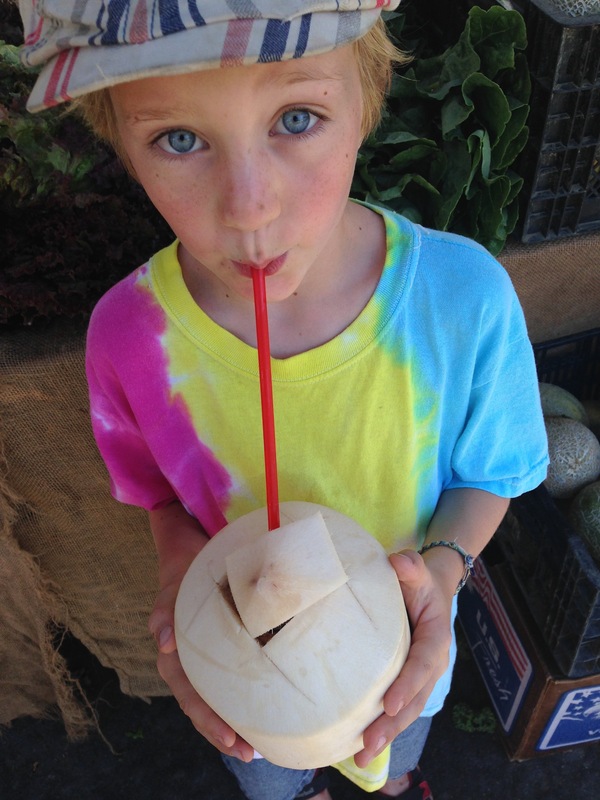 Fresh Raw Coconut: The Perfect Beverage! Part 2 of my coverage of the Montrose Farmer’s Market (fresh bread, naturally fermented foods and beverages, Goat Soap and gifts) will be up by the end of this week, in time for you to make a visit on Sunday if you can. Stay tuned! All photos are property of Abigail Morgan, L.Ac., FABORM, and may not be reproduced without written permission. Today is the Autumnal Equinox. Happy Fall! I love this time of year. Although here in Los Angeles it does not have the cool crisp feeling of Fall that I grew up with in New York City, the shift from summer to Fall is palpable. The days are getting shorter, the 100+ degree heat wave is over (though it’s still hot! ), and some of the trees are even boasting bright orange and yellow leaves. In spite of the heat, we are in a time of transition from one season to another, and nourishing the Spleen and Stomach organ systems (the Earth element) with the right foods is crucial for creating groundedness during times of transition. Many of you have asked me to share recipes and give tips on how to feed your family an organic, Real Food diet without losing your mind or going broke. This series, Cooking with My Kids, is my attempt to do just that. I will be posting more about the dishes we make and where we get our ingredients. In my house, Sundays and Mondays are when I get most of the cooking and prep done for the week. 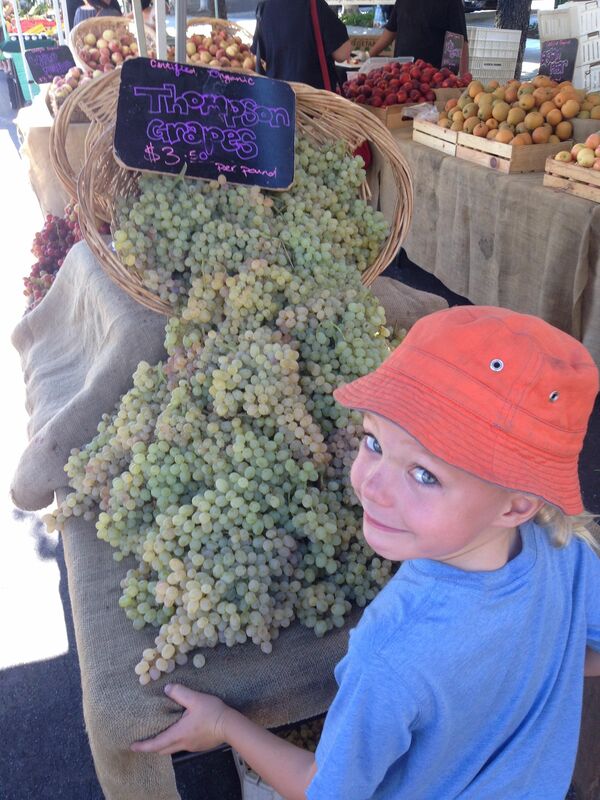 As I’ve shared here before, my kids and I hit our favorite farmer’s market early Sunday morning, and based on what we haul back and what (if anything…it’s been HOT here!) is growing in our garden, I create a meal plan for the week. Then I wash, chop, prep and cook as much as I can on my days off (Sunday/Monday), so the fullness of my work week, shuttling kids to and from school and making meals is not so overwhelming. Family dinners this time of year feel particularly important, and when they don’t result in sibling rivalry and food fights, they are also very satisfying. We had these butternut squash growing in our garden…honestly, I had almost forgotten they were there, as I fell a bit behind on weeding what with the 100+ degree heat wave that hit L.A. this month. (Seriously: my poor garden.) As my Little One and I were watering our new fruit trees this morning (thank you, TreePeople, for the free mango and peach trees! 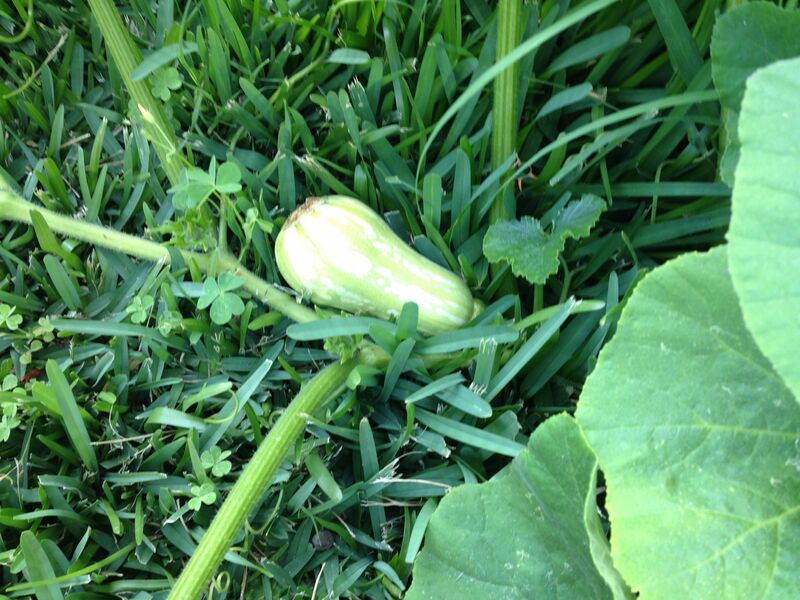 ), she reminded me of the butternuts hiding beneath the grass and overgrown green chard. I should have taken pictures of the ones we picked yesterday…oops! The squash snapped right off the vine, and I almost expected to see worms crawling out when I sliced them open, but there was the bright orange flesh with its shiny seeds glistening like teeth. The sage in my herb garden seems to thrive whatever the weather; I love using it for baked chicken, and it pairs very well with all kinds of winter squash, so worth having in your outdoor or container garden. I grabbed my favorite cookbooks for soup inspiration, Deborah Madison’s “Vegetarian Cooking for Everyone” (the 2010 version: I haven’t checked out the new one yet) and Sally Fallon’s in “Nourishing Traditions.” I compared their cooking times for butternut squash: Madison says 375 degrees for 30 minutes. Fallon says 350 degrees for an hour. To be honest, I hate following recipes. I like to refer to them for ingredient inspiration, cooking temperatures and total cups of water or broth, and I have to give credit where credit is due for providing the spine of a recipe, but beyond that I tend to go off book and improvise. You’ll find more specific instructions in the recipes in Madison’s and Fallon’s books, but my point here is that it’s easy to do your own thing: be inspired by a recipe but amend it to what’s in season, what you have on hand, and what your intuition and patience tells you to do. Since I knew I had to bake the butternut squash (I don’t have a dehydrator, and yuck, that would be gross), I figured I might as well bake some sweet potatoes while I was sweating indoors, and make two meals at once. Make it three if you do a double batch of the soup! Here’s the menu for two meals for the Autumnal Equinox. *I’m not including photos or a detailed recipe here, but you can make any sort of grilled cheese sandwich using good organic grassfed cheddar, gruyere, or swiss; I added sauteed spinach and some slices of heirloom tomato, and my favorite sourdough bread that we get at our local farmer’s market; I spread one side with butter and the pan with coconut oil, and cook until lightly browned. 6 c. chicken bone broth (follow my associate acupuncturist’s recipe for bone broth here) or chicken stock. If you are vegetarian, you can use water instead, but you might need to add a little more salt or seasonings to enhance the flavor of the soup. 1. Preheat oven to 360. 3. Cut squashes in half, remove seeds and discard. 7. Saute onions in a large soup pot with a pinch of salt, stirring occasionally until lightly browned, about 7-10 minutes. 8. While the squashes and sweet potato bake, cook the lentils for Meal 2 (if you’re making them both), and saute the spinach. 9. 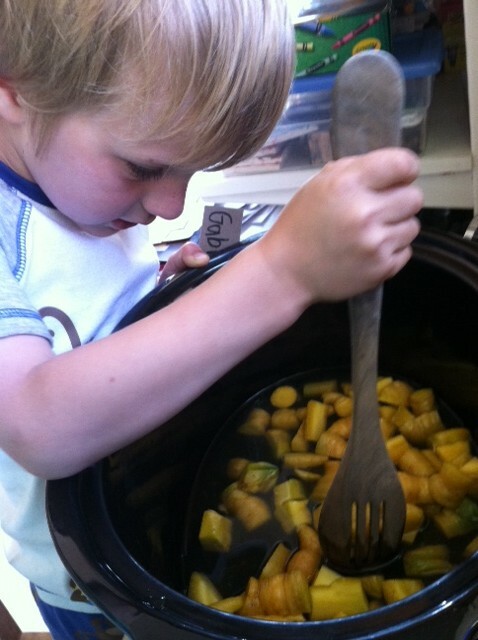 Scoop cooked squash from the skin with a spoon, being careful not to burn your hands. 10. Once onions are lightly browned, add the cooked squash to the onion mixture. Break up chunks with a wooden spoon. Mince garlic cloves directly into the squash/onion mixture, and add 1T of the butter. Cook on medium, stirring continuously for 3-5 minutes.11. Add 8 c. of water to the soup pot, turn heat to high, and cook until boiling. 11. Saute sage leaves in olive oil for 2 minutes. Remove from heat and cool on a paper towel for a few minutes, then chop finely and add to soup. Reserve a few leaves for garnishes on the soup. 12. Add dried herbs to soup. 13. Simmer soup for 20 minutes. 14. Puree soup with an immersion blender (or handheld blender). If the soup is too thick, add water or more broth. If too thin, add sour cream or make a roux with flour and water, and puree for another moment. 15. 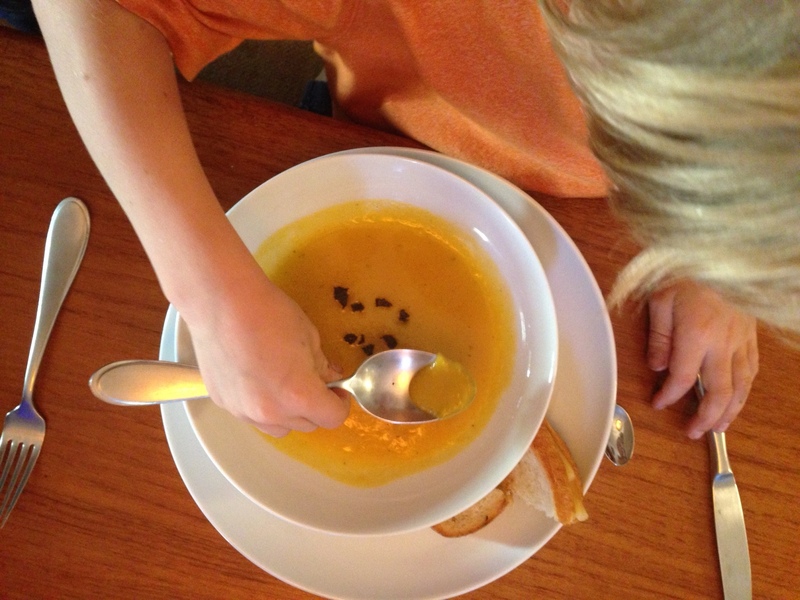 Ladle soup into bowls, top with goat cheese (optional), drizzle with olive oil. I served this alongside Grilled Cheese Sandwiches with Spinach and Heirloom Tomatoes, which are extra delicious when dipped in the soup. You could serve it with the following Baked Burritos instead, or make the Burritos for another night. This is a recipe inspired by an article I read in the now-defunct Mothering Magazine about 5-6 years ago. 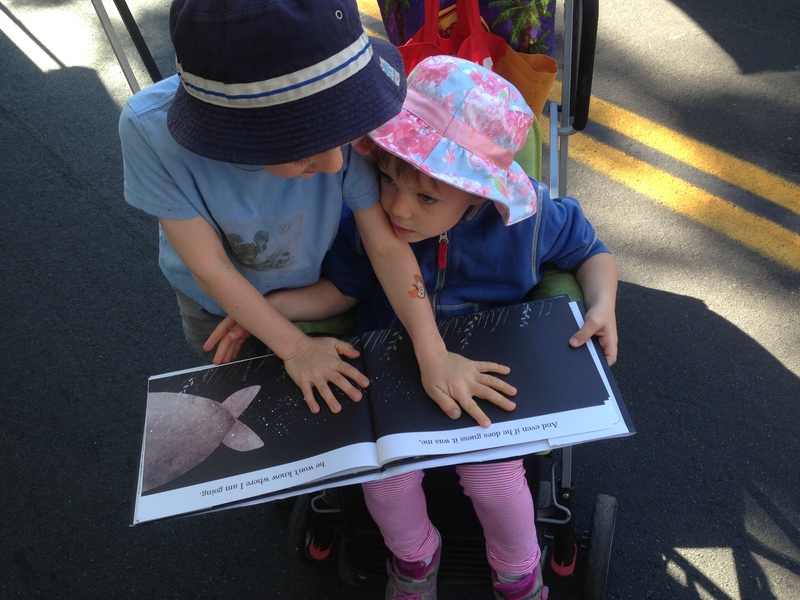 (The online Mothering is awesome, but I do miss that magazine in my mailbox every month!) I have tried and tried to find the original recipe online, so I can give the author proper credit: was it Peggy O’Mara? Cynthia Lair? (I’m big fans of both.) My searches come up blank. 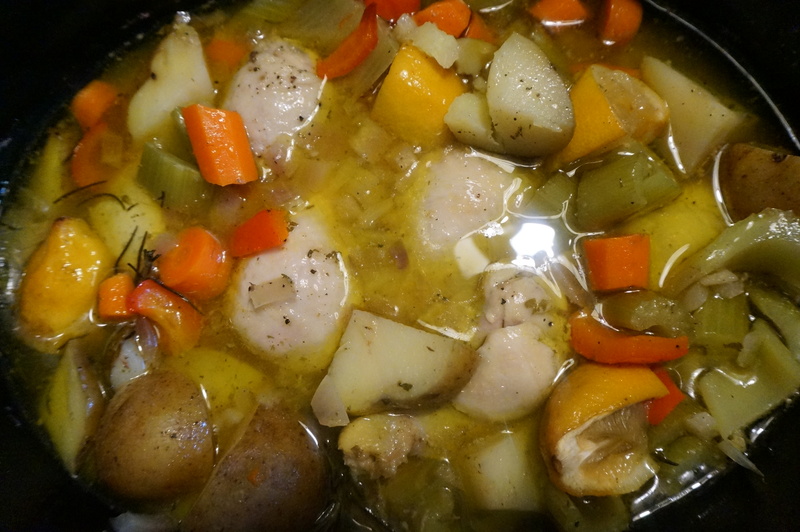 Anyway, over the years I have made this recipe my own, changing ingredients and making additions here and there, sneaking in stuff I want my kids, surplus veggies from our garden or those extra chunks of cooked chicken. 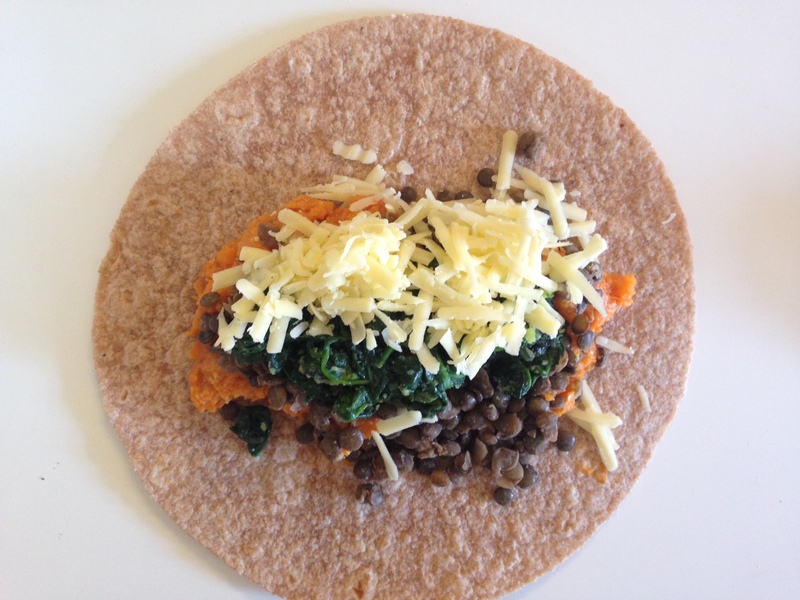 You can cook the sweet potato, lentils and spinach the night before, then assemble the burritos right before you want to bake them. Alternatively, you assemble the whole dish, cover it and put it in the fridge, and take it out the next day – dinner will be ready in 20 minutes. It is a very versatile recipe, and the main ingredients are super cheap, even when bought (or grown) organic. 2. Grease a 9 x 11 glass pan with coconut oil. 3. Wash sweet potato, prick in 2 spots with a knife. Bake for 60 minutes, or until soft. 4. Wash and drain the lentils. 5. In a medium pot, cook lentils with 2.5 cups of water and 1/2 tsp of salt; bring to a boil, then simmer for about 20-30 minutes, or until the water is cooked off and the lentils are soft and aromatic. 6. 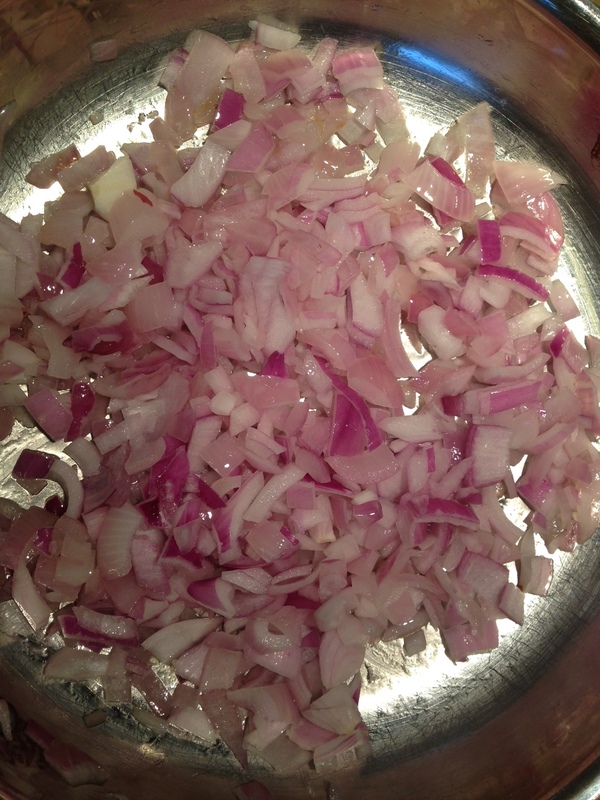 In a medium saucepan, saute the red onion in coconut oil or butter until tender. 7. Add the minced garlic to the onions and cook another 3 minutes or so. 8. Add the spinach to the onion/garlic mixture and cook for 3-4 minutes, until lightly browned. Remove from heat. 9. 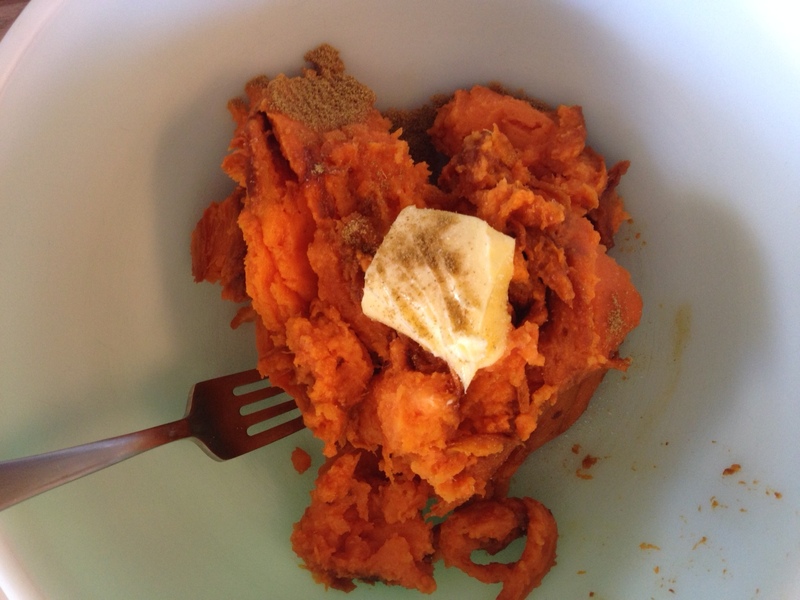 Once the sweet potato is done cooking, remove the skin and discard it. Put the cooked sweet potato into a large glass bowl. Turn the oven down to 325. 10. Add 1T butter, 1 tsp salt and 1T cumin to the sweet potato, and stir with a wooden spoon until well-mixed. 11. 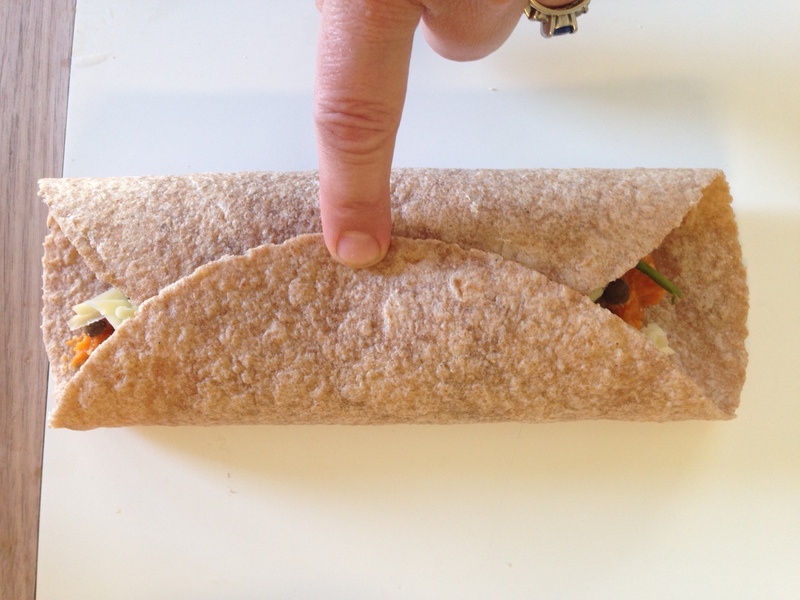 Spread all 6 tortillas on a large working space. 13. Add equal amounts of lentils, then cooked spinach/onion/garlic mixture, on top. Finish by adding some shredded cheese. 14. Fold in both sides of each tortilla, then flip it over and place in the greased glass pan. I find that six tortillas fit nicely in a 9 x 11 pan with a little room to spare. 15. Shred additional cheese on top of each tortilla (if you wish). You may cover the dish and refrigerate it at this point for up to 24 hours, if you’d like to cook it the next night. You could also freeze it, if you plan to bake the dish more than 24 hours from now. Or you can go ahead and bake it now if you want to eat it soon! 16. 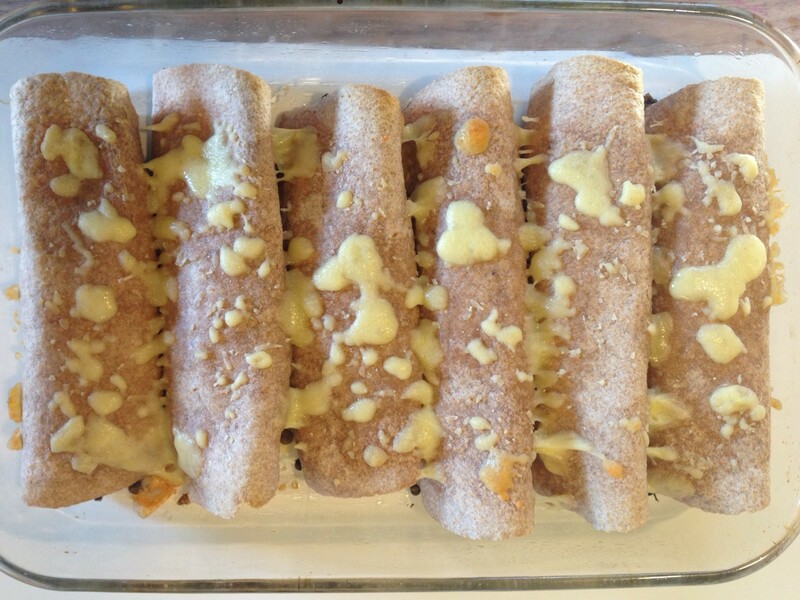 Bake in a 325 oven for 15-20 minutes. The dish is done when the cheese is nicely bubbling. Again, this recipe is super versatile. You can try adding different cooked vegetables, chunks of cooked chicken or pork, and experiment with different kinds of cheeses. Please let me know what you think in the comments section, and Happy Fall! All photos are copyright Abigail Morgan, L.Ac., 2014. The balance of Work and Life is never perfect. I’ve stopped expecting it to be. Whew, that’s a lot of hats. And a lot of time. We all have them, right? – those various Identity Hats. But when you become a parent, Time gets sucked into a vortex. Where, oh where, does it go? Since I haven’t yet figured out an acupuncture treatment that will create an 8th day in the week, I look for quality over quantity of time. There are only so many hours in a day. The more practice I get in being a parent, the more I continue to learn (and learn, and learn) to be gentle with myself, and not try to do so many darn things each day. If I can satisfy a need for each of my roles each day, in some small way, I feel happy. Today I’m thinking about one of the needs I have as a busy mom – in particular the need to find one-on-one time with each kid. Cooking with my kids is one of the ways I create Special Time while also creating the organic, homemade meals that keep us all healthy and happy. 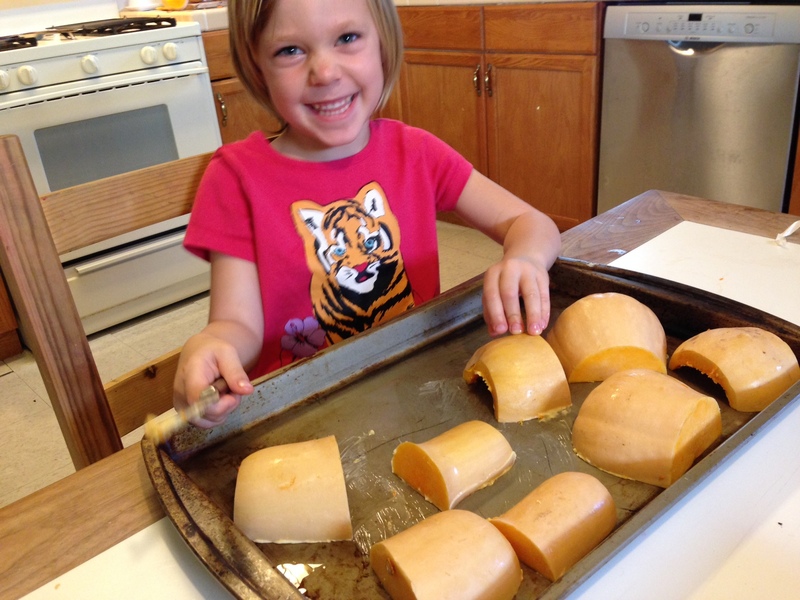 Recently, I’ve started finding time to prepare dinner with just ONE kid. It’s pretty awesome. 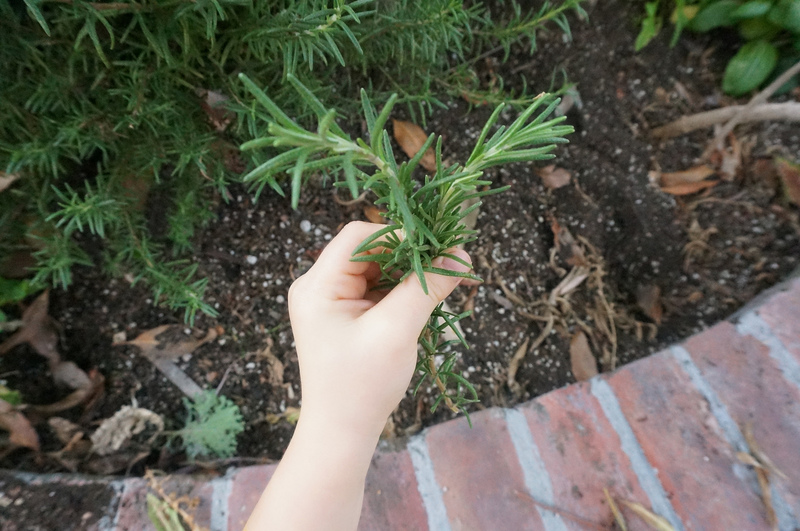 We chose rosemary and thyme because she can easily identify them, and gets great pleasure out of cutting them “all by myself!” with kitchen shears. Rosemary and thyme are wonderful herbs to bring out the flavor in chicken, and I like combining them with lemon, apple cider vinegar and bone broth for extra immune-boosting properties. One tip: if you have not yet found peace in cooking with a kid or two, keep in mind the Triple-Time Rule: however long you think it’ll take to prepare a meal, multiply that by THREE. Otherwise known as Lower Your Expectations. 2. Place the potatoes (quartered) around the drumsticks. 3. Add the carrots, celery, and red bell pepper, sprinkling them over the chicken and potatoes. 5. Add the bone broth, olive oil, apple cider vinegar, salt and pepper. You may want to drizzle additional olive oil over the entire dish after all ingredients have been added, depending on your taste. 6. Tuck the sprigs of rosemary and thyme between the drumsticks and vegetables. 7. Place the slow-cooker insert into the slow-cooker and set for 3.5 hours on HIGH. IMPORTANT NOTE: If you have young children in your family, please be mindful that small bones can come detached quite easily from chicken; be sure to check your child’s plate carefully for small bones, or remove all chicken from the bone before serving. PREP-COOKING NOTES: I washed the chicken drumsticks by myself. My daughter helped me wash the vegetables and potatoes, then sat in my lap and helped me cut them on a cutting board. (Obviously, at 3.5, she’s not old enough to be left alone with my Sudoku knife.) When I’m having Mama-Son cooking time, my 5-year-old will wash and peel vegetables by himself, and I allow him to cut them with a butter knife while I cut things like onions and garlic with a sharper knife. One of the lovely things about the slow-cooker is you don’t have to be in the kitchen with an eye on the stove: once it’s on, you can safely leave the house! Our slow-cooker automatically turns to “Warm” after the cooking time is finished, but I’ve found with this dish, it’s tastiest if it doesn’t sit on “warm” longer than 2 hours. 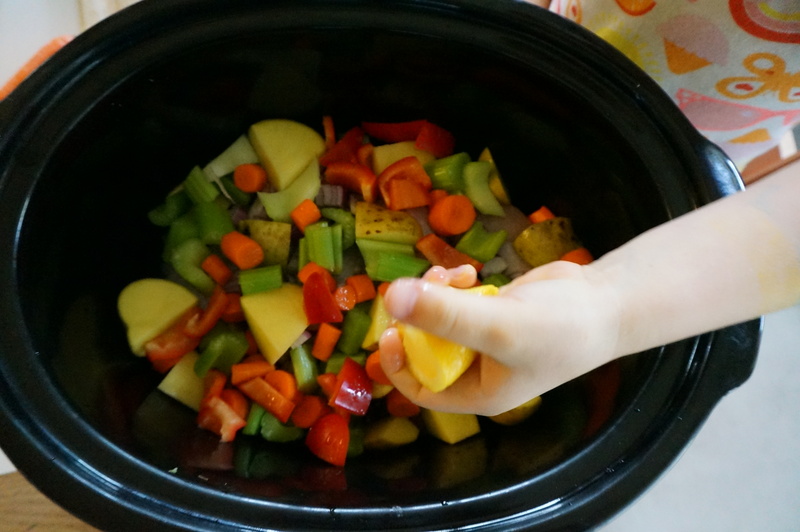 What slow-cooker recipes does YOUR family love? Welcome to our new series – What’s in Our Garden? Here at FLOAT: Chinese Medical Arts, we are passionate about our backyard edible gardens, and we want to share photos, ideas and recipes with you! Each week, we’ll be posting photos of what’s growing in our home gardens now, what we’re harvesting, what we’re struggling to keep alive, and the recipes we’re using to cook what we’ve picked. 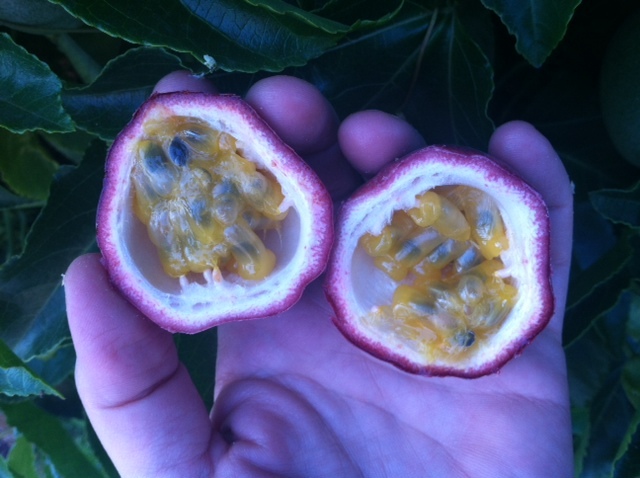 (Today I’ll be talking about passion fruit!) We also welcome your comments and invite you to share with us what’s growing in your garden. 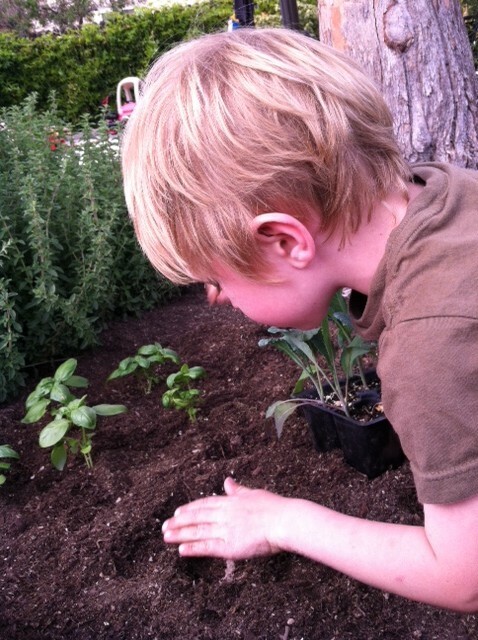 I have been inspired by my favorite blogger, SouleMama, who has been posting a series called “This Week in My Garden” all summer. So, a big tip of the hat goes out to Amanda Soule. We get a lot of questions from patients about how they can work, raise a family and still eat healthy, organic, real food. I grew up in New York City in an apartment building, so I still wake up some mornings in a state of happy shock that I actually have a garden with a 10 month growing season, and not just the local patch of grass we referred to as Tip-Toe Park (owing to the piles of dog poop). Some people have their entire garden in containers on a patio or indoors near a window. Others use a plot of land in a local community garden. Another great option is the Tower Garden, by Juice Plus+, an aeroponic 5-feet-tall vertical indoor garden that fits in even the smallest apartment. If you want more information about this, please send an email to frontdesk at floatchinesemedicalarts dot com or ask us about it at your next office visit. If you aren’t into gardening but you like to eat locally and with the seasons, getting to know your local farmer’s markets is the way to go. 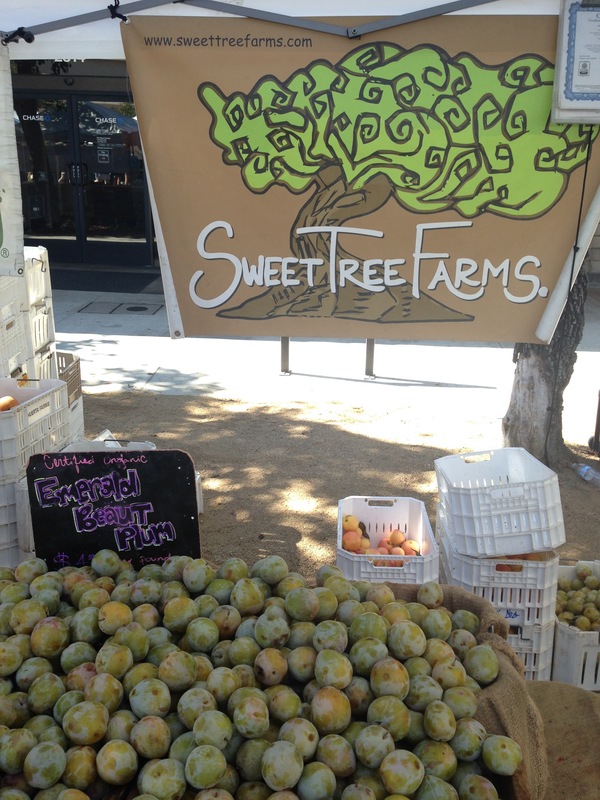 If you live in Southern California, here is a useful guide: http://projects.latimes.com/farmers-markets. Those of you who live in colder climates may have a shorter outdoor growing season, but you may still be able to find mostly year-round farmer’s markets, and/or subscribe to a CSA (Community Supported Agriculture). Tell us what works for you! In our garden, we don’t use chemical pesticides or fertilizers, but rely on compost and natural methods of pest control. We never grow genetically modified plants, focusing instead on heirloom varietals that require more maintenance but produce delicious, interesting crops. We also love to cook; I do much of the planning and cooking for my family of four, and Jacqueline is quite a well-known food blogger and recipe-writer (http://sweetbeetandgreenbean.net). Heidi, our office manager, has been gardening and cooking for years and often brings flowers or herbs from her garden to display at our front desk. Growing your own fruits, vegetables and herbs is one of the most affordable, healthy and holistic ways to feed your family. It’s also a great way to get picky toddlers and older children to get involved in cooking: when they pick it and help prepare it, they are so much more likely to eat it! Even organic, heirloom seeds cost just pennies, and you don’t need to have an enormous back yard (or even a back yard at all!) to grow your own produce. My son has taken to picking mint and ginger and making his own creative tea when he has a tummy-ache, and my daughter likes to pick lettuce and feed it to her stuffed animals. They also love love love to help me prepare meals. When I’m not in a rush, I welcome their help, and give them simple tasks to do (“Go pick some basil and spinach, please,” or for my 5-year-old, “cut these carrots, please”). When I am in rush, I have to remind myself that my kids’ pace is slower than mine, and though it may take an extra 30 minutes to involve them in making dinner, they will be more likely to eat it and rave about it if they’ve helped prepare it, from garden to plate. In the upcoming weeks and months, we will be featuring photos of an area of our garden along with a recipe we made with stuff we picked from it. Please post a comment in the comment section if you have a specific type of dish you’d like to see, or a plant you have questions about. So now let’s get to the pick of the day, along with a recipe. Passion Fruit in the City! This week, my kids and I harvested the first ripe passion fruits of the season. 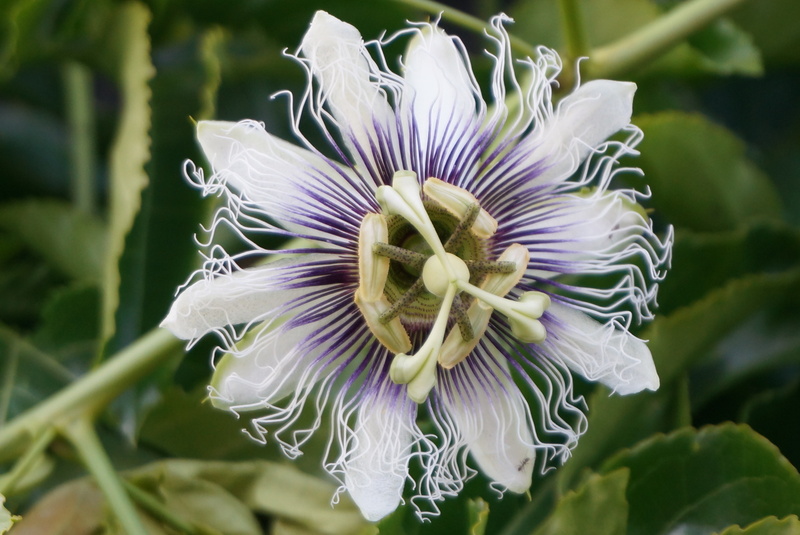 Passion fruit are super easy to grow (they do require some pruning! ), and they love full sun. They will climb on anything, so training them along a fence is the best way to go. 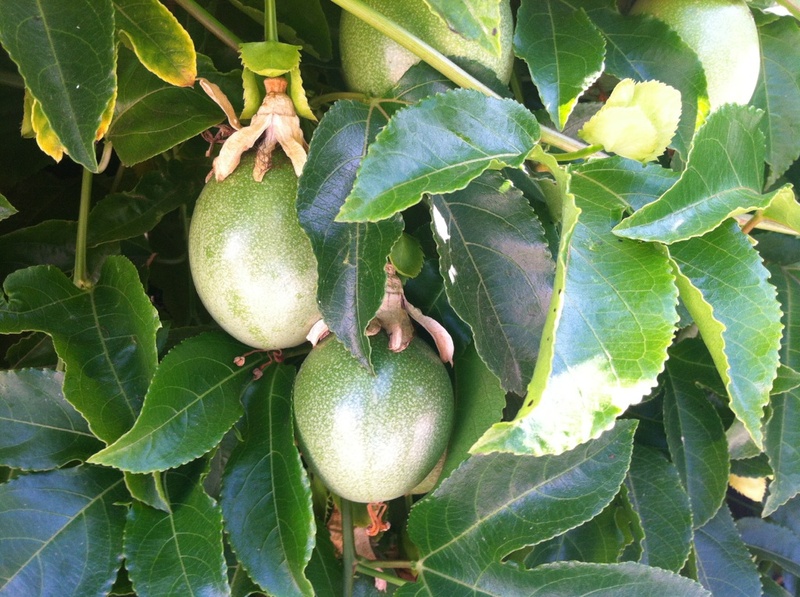 We put our passion fruit plants in from seedlings in March 2012, and they started producing fruit about 4-5 months later. We had some yummy ones last summer, but this year the yield is about three times as much, and the fruit seem to be ripening more predictably. According to Chinese Medicine, passion fruit is cooling and slightly bitter, and is said to calm the Shen (in other words, it has calming and sedative effects). Which is always a good thing for a harried mama. 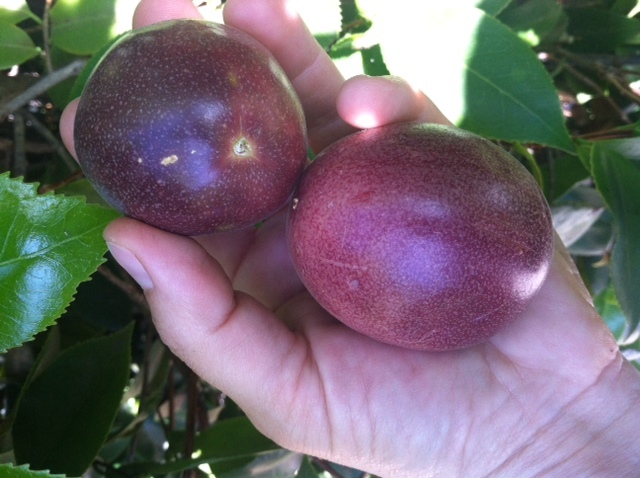 If you’re not growing your own passion fruit, look for them at your local farmer’s market or specialty store, especially in the summer. Put the yogurt in a bowl. Scoop out all of the fruit and yellow fleshy bits (you can eat the seeds! ), stir into the yogurt along with the coconut and honey or maple syrup (which helps cut the tart flavor of the passion fruit). Yum! What’s growing in your garden, if you have one, and what are you making from it? Post by Abigail Morgan, L.Ac, mother of two, licensed acupuncturist & herbalist and owner of FLOAT: Chinese Medical Arts. All photos by Abigail Morgan, L.Ac, all rights reserved.